Let’s face it, being a parent leaves little time to think about gifts. Yes, there are some very organized people that plan months in advance to order the perfect Father’s Day gift for their husband/Dad and organize the perfect brunch or dinner. For the rest of us, there are still alternatives that you can DIY, order online or buy quickly to show the Dad in your life all the love he deserves. TAKE A FAMLY PHOTO ON THE FLY: Take a special photo and frame it: There are multiple ways to print photo’s from PCs and mobile phones to home printers. So take out your phone, pocket camera or DSLR and shoot away. Cool Mom Picks posted with some great photo ideas. GO SHOPPING TOGETHER ON FATHER’S DAY! Most people don’t like to shop at brick & mortar stores, but after brunch or before dinner why not stop by a store to buy that special Dad a Father’s Day gift of his choice. 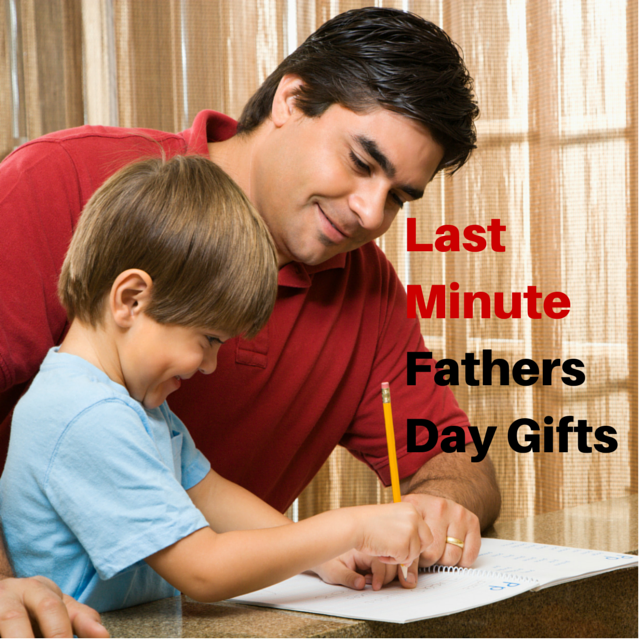 GIVE A COUPON FOR SPECIAL DAD TIME: Give Dad a coupon that says they get to plan a day of doing their favorite things, even if that means playing tennis with the guys..
ONLINE GIFT CARDS: There are so many websites that offer e-gift cards, which means a gift is a click away.. DONATE IN DAD’S HONOR: My husband has favorite charities so many times we include a donation to his favorite charity on Father’s Day. Many charities offer ways to donate online – just donate and print the reciept to put in his father’s day card! GET STREAMNG: What Dad does not like to be able to access his content on the go. So gifts such as Netflix if you don’t have it already, Slingbox (TV content on the go) or other streaming services make a great gift! Note: Some Smart TV’s offer Internet access to streaming services while other TV’s need hardware such as Roku, Chromecast or Amazon TV. DIY DADS: A great gift for Dads that love DIY is to have a family trip to the store to pick out the materials for a project on Father’s Day. For example, pick out a few options to build a new wood backyard chair for Dad, print the materials list and put that in the Fathers Day card. My husband loves to visit Home Depot and Lowes, so doing that on Father’s Day to build a project with his family as an activity always makes him happy! GIFT OF NEW TABLET OR E-READER: Dads on the move also need to consume content so why make them look at their small phone screen all day. Microsoft, Lenovo, Samsung, Apple and other companies make great touchscreen mobile tablets. To help choose consider their platform of choice. If Dad uses all Apple products, then an iPad may be the best fit. If Dad uses Windows then the Microsoft tablets are a great fit along with the Windows tablets made by PC manufactuers including Lenovo Yoga laptops that convert to tablet form. Android Dads have many tablet options as well including the Samsung tablets. My husband asked for a tablet or E-reader, so I told him that I would research it but he could “pick it out” ON Father’s Day. My husband is looking into Amazon E-readers or tablets because he wants to read outside and also highlight passages while reading. I told him that he can highlight text using apps or use the funtionality that the tablet offers. iPads for example allow annotations by taping and holding – then select highlight. With the Kindle you select the text and then choose the highlight button. What gifts are you getting the “Dads” in your life tomorrow?